How You Can Trade Like a Pro will show how anyone can learn to trade options and futures. The book provides the foundation to begin trading in options and strategies that go from beginner to beyond. The book includes real-life stories of transitioning from a part-time to full-time trader and Sarah’s signature “Trading Tip” comics, this book discusses a wide range of trading strategies, explaining how to trade options, the basics of technical analysis and chart reading. This book teaches how to trade using an account size that most people can relate to, making it a great read for anyone who is trading options or wants to trade options. How You Can Trade Like a Pro explains how to trade options in a clear and easy to understand manner. Readers will learn how to analyse the market and create a trading strategy using technical analysis, see actual trading strategies that Sarah uses, and learn how to create a trading plan. The trading strategies in this book are detailed strategies used by Sarah and designed for real people like you who lead busy lives. This book is for anyone who wants to be better educated about the markets, and make more informed trading and investment decisions. How You Can Trade Like a Pro is different than other trading books, it explains options trading and market analysis, and shows specific trading strategies that you can use. The book breaks down barriers and myths that usually stop people from understanding how to trade. This is a book written for real people who want to understand how they can trade for themselves. How You Can Trade Like a Pro explains the skills of trading that you need to know to trade better and understand the market. I love that Sarah covers trading options in this book. So many trading books either avoid options because the writers do not understand them or make options trading so complicated that people throw in the towel before they even try them out. How You Can Trade Like a Pro is an excellent tool for anyone interested in learning how to trade. As experts in this industry, we know the greatest barrier to entry is the terminology. Sarah breaks down complicated topics into simple terms. This book will give new investors the confidence to trade on their own. 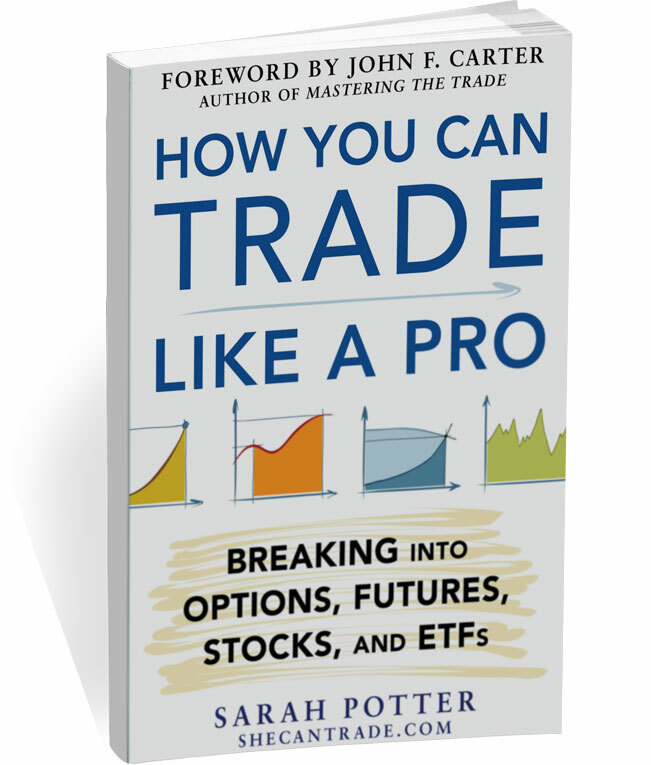 Sarah Potter [offers] a fresh voice with essential information for active traders. Her comprehensive, inviting book is an informative A to Z compendium to help new traders find their path to profitable trading. TraderPlanet members vote her stories as some of the most popular on our site. We are sure you will find her writing to be engaging as well.